This great little movie was an instant hit to me with it’s fabulous animation and instantly likeable characters. 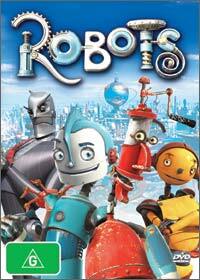 Robots tells the tell of a hand me down young robot by the name of Rodney Copperbottom (voiced by Ewan McGregor) who goes to the city to show the greatest robot of all time his wonderous invention (a dishwashing robot). What follows is a fantastic journey of the “little people” taking the good fight against the corporation. It’s not something that has never been done before, however Blue Sky Studios have brought this little world to such glorious life that I was utterly enthralled the whole time from the very start to finish. What will amaze a lot of geeks is the high level of name talent that they pulled together to make this movie happen. There’s Ewan McGregor, Halle Berry, Greg Kinnear, Mel Brooks as the amazing Bigweld, Drew Carey, Amanda Bynes, Jim Broadbent, and Robin Williams as the rogue Fender. You are guaranteed to see some of the best animation that is currently on the go in DVD with a transportation sequence that has to be seen to be believed. I’m not going to go into the whole film too much as essentially it is a no brainer but trust me, I watched it with my two year old (she’s almost 3) and we were both transfixed for the entire show. The audio is flawless, the video to die for, with a soundtrack that is just begging to be played over and over again. There are a stack of extras on this disc as well, however for the most part they are just filler. I’ve no doubt that there will be a two disc edition at some stage (it certainly deserves it) with proper commentary by the stars, well I hope so anyway. This is a MUST have release. It is brilliant and simply a ton of fun for the whole family, with a neat tale with true morals and lessons about family and friendship.